In 2015 it was estimated that there were 244 million migrants globally. The reasons for human migration are many; economics, conflict and the effects of climate change are some of the highest contributing factors and some migrants find themselves in lands quite different to their home. Starting a new life, learning a new language and joining new societies is a daunting task and one which the Gaia Education’s project Sicilia Integra is working on right now. This project seeks to not only integrate migrants into their new homes, but also to develop skills in organic agriculture and social enterprise development. Sicilia Integra is also going a step further by supporting restorative faming and food production in the region. 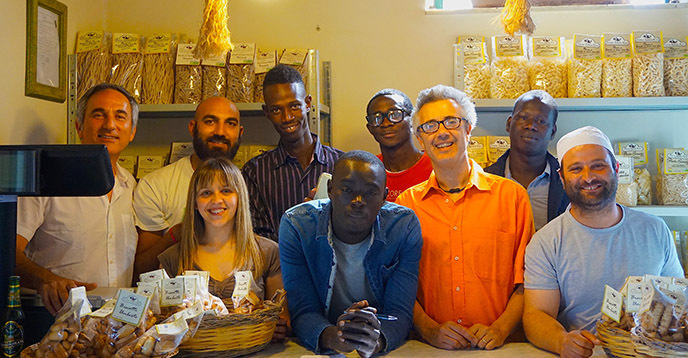 Participants of Sicilia Integra have already completed a five-week course in Design for Sustainability and Organic Food Systems and are now engaged in farm work, bakery work and the development of Grani di Gaia – the business. The next phase is to bring in unemployed Sicilian youths to the projects to facilitate social cohesion, create meaningful jobs and contribute to the resurrection of growing ancient wheat grains in an environmentally sustainable way in Sicily. It is a triple win situation.